Real-time participant reports of putative triggers of cocaine use (A) and craving (B) in the 5 hours of random-prompt entries preceding each episode. F and P values reflect linear trends in hours before use from repeated-measures logistic regressions (SAS GLIMMIX Macro; SAS Institute Inc, Cary, North Carolina). The r values are effect sizes for the linear trends and can be compared across figures. The number of data points per bar ranges from 83 to 101 for use and from 55 to 97 for craving. NS indicates nonsignificant P value. Real-time participant reports of putative triggers of heroin use (A) and craving (B) in the 5 hours of random-prompt entries preceding each episode of use. (Episodes of heroin and cocaine use together are also included.) F and P values reflect linear trends in hours before use from repeated-measures logistic regressions (SAS GLIMMIX Macro; SAS Institute Inc, Cary, North Carolina). The r values are effect sizes for the linear trends and can be compared across figures. The number of data points per bar ranges from 33 to 49 for heroin use and from 68 to 103 for heroin craving. NS indicates nonsignificant P value. Context In ecological momentary assessment (EMA), participants electronically report their activities and moods in their daily environments in real time, enabling a truly prospective approach to the study of acute precipitants of behavioral events. Ecological momentary assessment has greatly enhanced the study of tobacco addiction, but its use has rarely been attempted in individuals with cocaine or heroin addiction. Objective To prospectively monitor the acute daily life precipitants of craving for and use of cocaine and heroin. Participants A volunteer sample of 114 cocaine- and heroin-abusing outpatients who were being treated with methadone provided EMA data on handheld electronic devices for 14 918 person-days (mean, 130.9; range, 6-189 days per participant). Of these outpatients, a total of 102 (63 men, 39 women) provided acute precraving and/or preuse data and were thus included in the present analyses. Main Outcome Measures Changes in reports of mood and exposure to 12 putative drug-use triggers at random intervals during the 5 hours preceding each self-reported episode of drug craving or use, analyzed via repeated-measures logistic regression (generalized linear mixed models). Results During the 5 hours preceding cocaine use or heroin craving, most of the 12 putative triggers showed linear increases. Cocaine use was most robustly associated with increases in participants reporting that they “saw [the] drug” (P < .001), were “tempted to use out of the blue” (P < .001), “wanted to see what would happen if I used” (P < .001), and were in a good mood (P < .001). Heroin craving was most robustly associated with increases in reports of feeling sad (P < .001) or angry (P = .01). Cocaine craving and heroin use showed few reliable associations with any of the putative triggers assessed. Conclusions These findings confirm that polydrug-abusing individuals can provide behavioral data in their daily environments using handheld electronic devices and that those data can reveal orderly patterns, including prospectively detectable harbingers of craving and use, which may differ across drugs. The study of craving and lapse during attempts to quit smoking has been quietly revolutionized by the use of handheld data-collection devices that enable study participants to report, in real time, their activities and moods in their daily environments.1 This methodology is referred to as experience sampling2 or ecological momentary assessment (EMA).3 A personal digital assistant (PDA) (eg, PalmPilot) configured for use in EMA is called an electronic diary. Ecological momentary assessment comprises 2 complementary types of data collection. The first type occurs through random prompts, enabling assessment of the base rates of exposure to putative craving/lapse triggers, such as stressors and drug-associated cues.4 The second type of data collection is participant-initiated; participants are typically instructed to initiate an EMA entry immediately after each episode of craving or use. These event-driven data provide near–real-time self-reports of such episodes. Ecological momentary assessment data collected through random prompts enable a truly prospective approach to the question of what events precede a specific episode of use. For example, Shiffman and Waters5 used such data to show that lapses to cigarette smoking were preceded by increases in negative affect across a time frame of hours, but not days—in other words, during a period that could not have been captured if participants had merely made daily visits to a laboratory for assessment. Studies of illicit drug use with EMA are far more rare. For example, to determine whether stress predicts relapse to cocaine or heroin use, there is only a small body of non-EMA prospective studies whose time frames were not sensitive to episodes of acute stress. The general finding from such studies has been that prospective measures of stress can predict relapse only when aggregated across times of 3 to 12 months, not week by week.6-8 The effects of more rapid increases in stress cannot be determined without EMA data. The near absence of EMA studies presumably reflects reluctance to entrust handheld electronic devices to individuals from the relevant populations, along with concern that meaningful real-time reports cannot be collected during use of intoxicating drugs. However, some studies have shown that EMA is possible in users of illicit drugs, providing new insights into the natural history of 3,4-methylenedioxymethamphetamine (Ecstasy) use9 and demonstrating that cannabis smokers10 and homeless users of crack cocaine11 will use and return cell phones issued for EMA recording. Larger data sets would help to resolve long-standing theoretical questions about the precipitants and process of drug craving and use and may also lead to better outcome measurement in clinical trials12 and even to new forms of tailored, on-the-spot treatment interventions. In this study, we used EMA to monitor craving for and use of cocaine and heroin in a large sample of outpatients being treated with methadone. (Methadone maintenance, though highly effective, does not entirely eliminate heroin use in all patients.) Herein, we present data on the time frame of mood and cue exposure in the hours before self-reported episodes of drug craving and use. Participants were cocaine- and heroin-using outpatients being treated with methadone at a treatment-research clinic in Baltimore, Maryland. Inclusion criteria were (1) age between 18 and 65 years; (2) evidence of physical dependence on opiates (by self-report and physical examination); and (3) evidence of cocaine and opiate use (by self-report and urine screen). 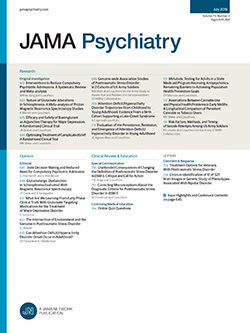 Exclusion criteria were (1) schizophrenia or any other DSM-IV psychotic disorder, history of bipolar disorder, or current major depressive disorder; (2) current dependence on alcohol or any sedative-hypnotic drug (by DSM-IV criteria); (3) cognitive impairment severe enough to preclude informed consent or valid self-report; and (4) medical illness that would compromise participation in the study. We aimed to enroll at least 100 participants for adequate power to examine differences in episodes of craving and use and random prompts. A total of 130 participants were enrolled, of whom 114 attended the clinic long enough to be issued a PDA. They carried PDAs for 14 918 person-days (mean, 130.9; median, 162.5; range, 6-189 days per participant). Of these 114 participants, a total of 102 (63 men, 39 women) provided acute precraving or preuse data and were thus included in the present analyses. Their mean age was 40.7 years (standard deviation [SD], 7.9; range, 20-58 years), and they had completed a mean of 11.8 years of education (SD, 1.5; range, 7-15 years). Self-reported race/ethnicity was 61% white, 36% African American, and 3% Hispanic. At treatment entry, 36% were unemployed, 33% were employed full-time, and most of the others were employed part-time. In the 30 days before treatment entry, they had used heroin on a mean of 29.2 days (SD, 3.4; range, 5-30 days; the participant reporting 5 days of use had transferred from a community methadone program) and cocaine on a mean of 19.6 days (SD, 9.3; range, 4-30 days). The main route of heroin use was reported as intravenous (62%) or intranasal (38%); the main route of cocaine use was reported as smoked (49%), intravenous (43%), or intranasal (7%). The study was designed to assess the natural history of craving and lapse against a background of methadone maintenance, weekly drug counseling, and abstinence reinforcement; all participants received the same treatment. Participants attended the clinic 7 days a week for up to 20 weeks; methadone was administered daily (target dose, 100 mg/d); urine drug screens were conducted 3 times per week. Abstinence reinforcement (vouchers given in exchange for urine specimens negative for cocaine, opiates, or both) was in place from weeks 7 to 18 (12 weeks total; up to $2310 in vouchers was available for participants continuously abstinent from cocaine and opiates); voucher procedures were similar to those used in our prior studies.13 Participants were also assigned target quit dates for heroin (first day of week 5) and cocaine (end of week 6, just before vouchers became available). The use of quit dates was intended to make the study similar to prior EMA studies of cigarette smokers in which EMA data were collected during ongoing smoking and subsequent attempts at quitting; there were no consequences in our study for nonadherence to the quit dates. A PDA was issued to each participant at the end of week 3. Our internally developed transactional electronic diary software14 running on the PDAs triggered 5 random prompts per day for 5 weeks, then 2 random prompts per day for 20 weeks. Random prompts were timed to occur only during each participant's typical waking hours, which were programmed into the PDA for each day of the week before the device was issued. Participants were also instructed to initiate an event-contingent entry whenever they craved without using or used cocaine and/or heroin. At each event-contingent or randomly prompted entry, participants reported where they were, whom they were with, and what they were doing and answered questions about their mood. Among the items assessed in each randomly prompted entry were putative triggers of craving and lapse, taken from Heather and colleagues’15 adaptation of Marlatt and Gordon’s16 taxonomy of relapse triggers (derived from open-ended interviews and from checklists). Each item began “Within the past hour . . . ” and was answered with yes or no. The trigger items were, “I felt bored”; “I felt angry or frustrated”; “I felt worried, anxious, or tense”; “I felt sad”; “I felt others were being critical of me”; “I was in a good mood and felt like celebrating”; “I felt ill, in pain, or uncomfortable”; “I saw heroin or cocaine”; “Someone offered me heroin or cocaine”; “I wanted to see what would happen if I used just a little heroin or cocaine”; and “Out of the blue, I felt tempted to use heroin or cocaine.” Participants were asked to specify whether the drug in question was heroin, cocaine, or both. Based on clinical experience, we added the item, “Within the past hour, I handled $10 or more in cash” (we chose $10 because our patients typically reported their drug use in $10 units). The PDA models used were the original Palm Zire and its successor, the Palm Zire 21 (Palm Inc, Sunnyvale, California). Each participant was assigned 2 PDAs that were swapped weekly so that we could recharge the batteries after uploading the data. Our transactional electronic diary software locked all of the PDA's nonstudy functions to reduce its street value. Each participant could lose or break 1 PDA and have it replaced; a second loss resulted in discharge from the study (this occurred with 15 participants). Participants who completed the study without having lost or broken any PDAs were allowed to either keep one (with its functions unlocked) or return it for $50. To enhance accuracy in reporting, participants were assured that the clinic staff would not see the content of their EMA entries; however, counselors could see a log of each participant's number of missed random prompts. Participants who missed more than 15% of random prompts more than 2 weeks in a row were to be discharged from the study (no participants had to be discharged for this). There were no rules concerning the completeness of event-contingent entries. The study was approved by the institutional review board of the National Institute on Drug Abuse Intramural Research Program. Each participant gave written informed consent before being enrolled. To evaluate the time frame of exposure to putative relapse triggers before episodes of craving and drug use, we examined the randomly prompted entries in each of the 5 hours preceding each event-contingent entry (with craving or use treated separately). Thus, all data given here are from randomly prompted entries, the selection of which was determined by their proximity to a subsequent event-contingent entry. There were fewer event-contingent entries for heroin than for cocaine; to provide enough power for data analysis, entries involving only heroin were combined with those involving both heroin and cocaine. Justification for combining the data this way includes the observation that the daily and weekly temporal patterns of heroin-and-cocaine entries were more similar to those of heroin-only entries than cocaine-only entries (data not shown). To determine whether the patterns in the data represented statistically significant changes over time, we used repeated-measures logistic regressions (SAS GLIMMIX Macro; SAS Institute Inc, Cary, North Carolina), with hours before use (1, 2, 3, 4, or 5) as the within-subject independent variable. The precraving and preuse data sets were analyzed in parallel. A separate regression was performed for each putative trigger, and each regression included a control term for the number of records that each participant contributed to the data set. A first-order autoregressive error structure provided the best fit to the data. Contrast coefficients were used to test for a linear trend in hours before use. The criterion for significance was P ≤ .05, with trends noted at P ≤ .10. Regardless of statistical significance, the effect size of the linear trend was also expressed as a correlation coefficient.17,18 An additional set of control analyses is described in the “Results” section. A total of 34 400 random prompts were issued; of these, 26 969 were answered (mean, 75%; median, 80%, range, 22%-98% per participant), for a mean of 1.8 per day (median, 1.9; range, 0.02-4.1 per day). The rate of PDA nonrecovery (breakage or loss) was 1 for every 226 person-days of use. Two thousand five hundred event-contingent entries were initiated (mean, 21.0; median, 14.5; range, 0-131 per participant), for a mean of 0.2 per day (median, 0.1; range, 0-2.2 per day). Of the event-contingent entries, 37% reflected episodes of drug use and 63% reflected episodes of drug craving. Of the 102 participants included in the present analyses, 95 provided random-prompt data during the 5 hours before episodes of craving, and 80 provided random-prompt data during the 5 hours before episodes of use. The present article includes data from 1555 randomly prompted entries (858 precraving only, 632 preuse only, and 65 both). Of these entries, 850 involved cocaine alone (378 precraving only, 435 preuse only, and 37 both), 227 involved heroin alone (170 precraving only, 47 preuse only, and 10 both), and 478 involved both drugs (310 precraving only, 150 preuse only, and 18 both). As mentioned, episodes with heroin alone and with both drugs were combined for analysis. The putative triggers we assessed showed significant linear increases before cocaine use and heroin craving, but not before cocaine craving or heroin use. All 12 putative triggers showed significant linear increases in the hours before cocaine use (Figure 1A). In terms of effect sizes, the increases were especially robust for the following triggers: participants “saw [the] drug,” were “tempted to use out of the blue,” and “wanted to see what would happen if I used just a little.” Of the items assessing mood, good mood showed the largest increase. Only 3 of the 12 putative triggers showed significant linear changes in the hours before craving cocaine (Figure 1B). The effect sizes were relatively small, reflecting the fact that the changes were less orderly than in the preuse data; for 1 of the 3 triggers (“saw drug”), the change was actually a linear decrease. Similarly, only 3 of the 12 putative triggers for heroin use showed significant linear changes (Figure 2A). The effect sizes were relatively small, the changes were not very orderly, and for 1 of the 3 triggers (“was offered [the] drug”), the change was actually a linear decrease. Seven of the 12 putative triggers showed significant linear increases in the hours before craving heroin (Figure 2B). In terms of effect sizes, the increases were most robust for items assessing mood, especially sad mood. For heroin, the trigger “saw [the] drug” was reported more often before use than before craving (F1,10 = 9.84, P = .01). (This analysis included 132 data points from 56 participants; df reflect the number of data points per participant.) For cocaine, the following triggers were reported more often before use than before craving: good mood (F1,13 = 65.32, P < .001), sad mood (F1,13 = 21.44, P < .001), “saw [the] drug” (F1,13 = 14.09, P = .002), “tempted out of the blue” (F1,13 = 12.82, P = .003), “was offered [the] drug” (F1,13 = 11.94, P = .004), and felt bored (F1,13 = 7.45, P = .02). (These analyses included 118 data points from 55 participants.) Other comparisons were not statistically significant. We examined the randomly prompted data for instances in which mood or cue exposure underwent increases similar to the ones seen here without being followed by reports of craving or use. To be confident that we were examining periods of abstinence, we restricted these control analyses to the participants who had at least 1 week of urine-verified simultaneous abstinence from heroin and cocaine (n = 42, with 1-25 weeks of abstinence). Then, to ensure that this subsample was comparable with the total sample of 102 participants, we reran the main preuse analyses on the subsample; the pattern of results was similar to what we saw in the total sample (data not shown). We then created a data set of randomly prompted entries from each participant's first week of verified abstinence, excluding all randomly prompted entries that occurred up to 5 hours prior to an episode of craving. To have anchor points comparable with the event-contingent entry points, we identified the 3 most common times of day for drug use in these 42 participants: 2 to 3, 5 to 6, and 8 to 9 PM. Finally, we looked for linear trends in the random prompts leading up to those times (operationalized as 2:30, 5:30, and 8:30 PM); significant increases would be evidence for false-positive, nonpredictive buildups in exposures to putative triggers. Of the 36 associations tested thusly (12 triggers at each control time), only 3 showed significant increases: felt worried prior to 2:30 PM (F1,98 = 7.09, P = .009, r = 0.26), felt sad prior to 5:30 PM (F1,103 = 6.33, P = .01, r = 0.24), and felt angry prior to 8:30 PM (F1,94 = 4.94, P = .03, r = 0.22). In each instance, the percentage of yes responses appeared lower than what was seen before episodes of use (control percentages peaked at 5% for feeling worried before 2:30 PM, 7% for feeling sad before 5:30 PM, and 16% for feeling angry before 8:30 PM; data not shown). These findings offer an unprecedented glimpse into the buildup of mood changes and cue exposure in the hours before cocaine and heroin use or craving during outpatient treatment. The findings confirm that polydrug-dependent individuals can provide data about their daily activities in real time using handheld electronic devices and that those data can reveal orderly patterns, including prospectively detectable harbingers of craving and use. We hasten to acknowledge that this first look at our data is limited in several important ways. For example, we have not yet examined the effects of participants' physical locations, companions, or activities, nor the differential harbingers of craving and use episodes that participants specifically attributed to each of the putative triggers after the fact. We also cannot rule out the possibility of reactivity, eg, that randomly prompted reports of increased temptation to use drugs may have become self-fulfilling prophecies, causing rather than indexing the increased likelihood of subsequent use. Alternatively, the use of the electronic diary may have had therapeutic effects (many of our participants reported having found EMA helpful in their attempts to remain abstinent,19 and none reported the opposite). However, reactivity to assessment has not been prominent in other EMA studies in which it was formally assessed.20,21 Another limitation is that we did not correct for multiple tests of significance. For our control analyses of periods of abstinence, this was actually the most stringent way to look for false-positive increases in trigger exposure, and for our main analyses, we felt that this was acceptable because we emphasized the overall pattern of results (eg, more associations for cocaine use than for cocaine craving) rather than the importance of any 1 association. In fact, we believe that the analyses with few significant findings (eg, predictors of cocaine craving and heroin use) should be considered negative. Finally, we know that not every episode of drug use was reported, though the temporal resolution of urine drug testing makes the number of unreported uses difficult to determine. Direct comparison of EMA and urine data will be addressed in future analyses. The occurrence of unreported episodes of drug use (or craving) does not change the conclusions to be drawn from the present analyses, except for the caveat that unreported episodes might have different triggers than reported ones. In future studies, we will be attempting to reinforce accuracy in participants' reporting of drug use. Bearing these limitations in mind, we wish to highlight some interesting aspects of our findings. For heroin, the putative triggers we assessed showed linear increases before craving, but not before use. Our speculative explanation for this is that our methadone-maintenance procedure, with its dosage ceiling of 100 mg/d, was sufficient to dissociate such triggers from heroin use but was not always sufficient to suppress craving. Another possibility is that the associations will emerge as we examine our data more specifically in terms of the circumstances of use, as mentioned. Yet another possibility is that the increases in trigger exposure for heroin occurred across a longer time than the 5 hours we examined in the present analyses. The base rate of participants' reporting having handled at least $10 in cash in the past hour was unexpectedly high (an interesting finding in itself, perhaps reflecting our participants' largely cash-based financial lives and their reliance on public transportation), but its association with cocaine use and heroin craving was also very clear, supporting the widespread clinical impression that having cash is a trigger and suggesting that handling cash should be included in formal taxonomies of relapse precipitants. Of course, some of the increase in handling cash before cocaine use probably reflects preparatory activities for purchasing cocaine—a marker rather than a trigger. To whatever extent the association may be causal, it does not militate against the use of cash payments for research participants, because there is strong evidence that cash payments need not precipitate drug use.23 In future analyses, we will look more closely at circumstances under which cash is or is not a seeming trigger of craving or use. Our control analysis of data from periods of urine-verified abstinence suggests that, for the most part, the putative triggers we assessed do not simply increase at particular times of day, producing false-positive predictions. Nonetheless, a few such blips did emerge; this finding is similar to a finding by Shiffman and Waters5 in cigarette abstainers. To have clinically acceptable positive predictive values, the triggers we assessed will probably need to be combined with data on physical locations, companions, and activities. If additional analyses along these lines show that event-contingent data predict use and craving both sensitively and specifically, then real-time detection of such responses on their ascending limb could prompt on-the-spot PDA-based tailored feedback25-28 that could potentially be developed as an effective therapeutic intervention to prevent episodes of drug use. Correspondence: David H. Epstein, PhD, National Institute on Drug Abuse Intramural Research Program, Treatment Section, Clinical Pharmacology and Therapeutics Branch, Room 01B-606, 251 Bayview Blvd, Ste 200, Baltimore, MD 21224 (depstein@intra.nida.nih.gov). Submitted for Publication: March 11, 2008; final revision received June 5, 2008; accepted June 20, 2008. Funding/Support: This study was supported by the Intramural Research Program of the National Institute on Drug Abuse, National Institutes of Health. Additional Contributions: The National Institute on Drug Abuse Intramural Research Program Archway Clinic staff collected data for the study.